Allison’s T3270R xFE transmission revealed. 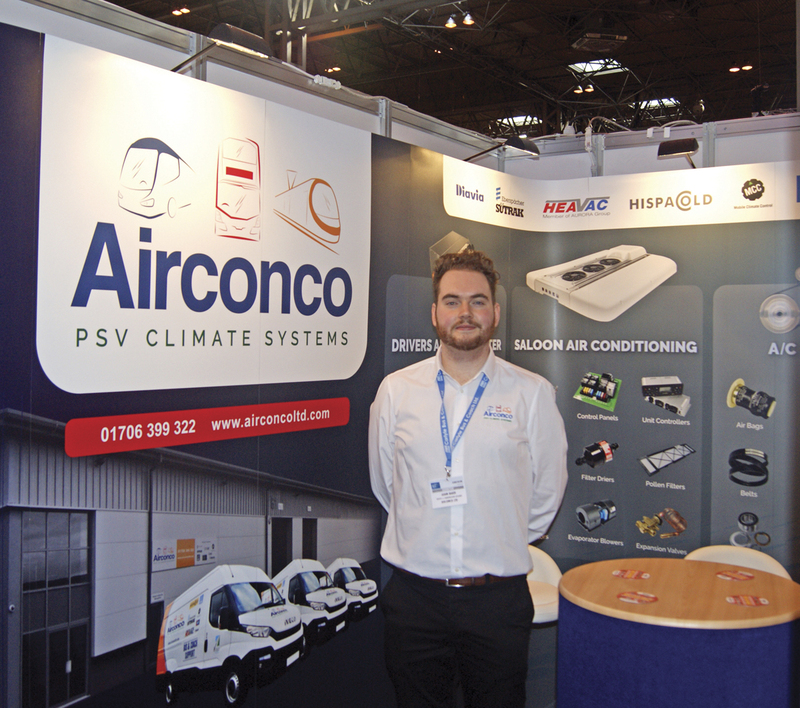 Adam Baker from Airconco alongside his company’s new look logo. 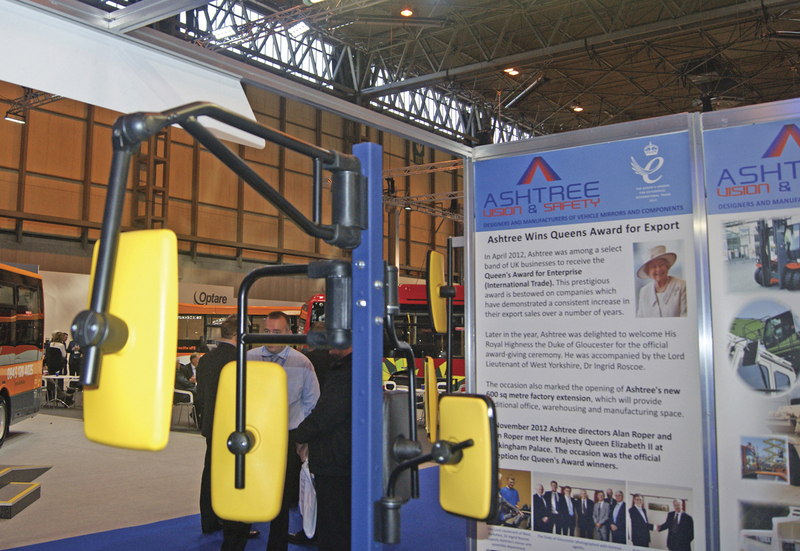 One of Ashtree Vision and Safety’s new wing mirror arm mouldings. 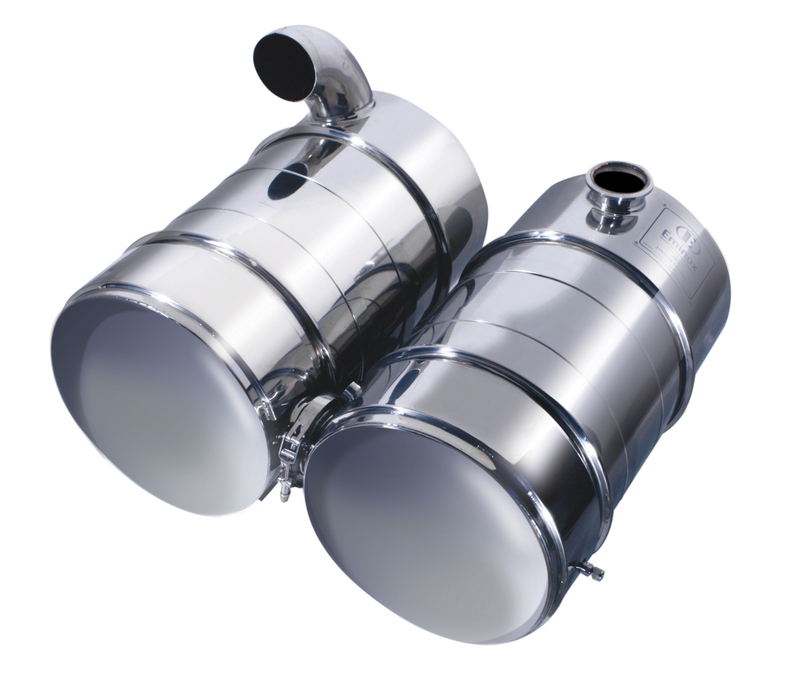 Eminox was promoting how it can keep fleets operating in the upcoming ULEZ compliant. Forgeway built a bus from its newly rebranded packages. Q’Straint’s Quantum onboard one of the Wrightbus deckers due for delivery to Lothian Buses. Some of the equipment installed on the Yutong E12 as part of 21st Century’s ‘connected bus’. 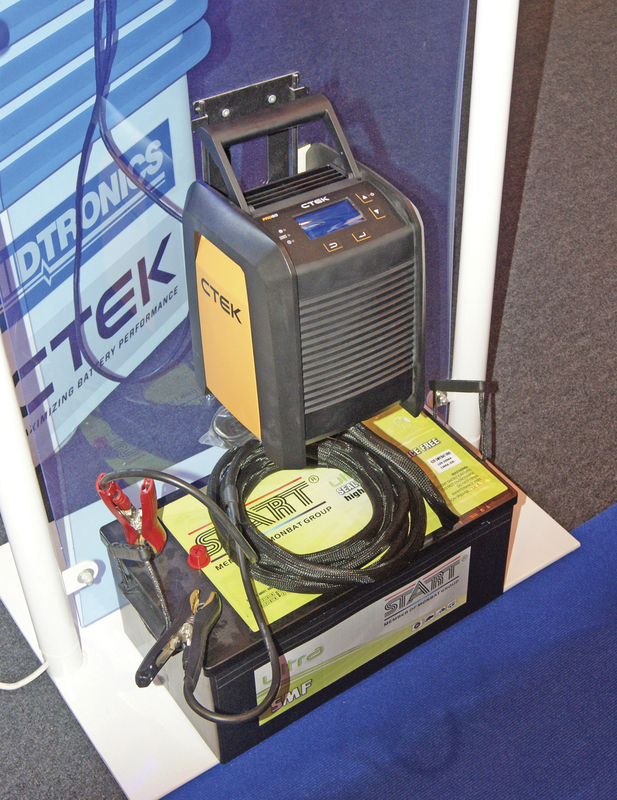 The CTEKpro60 battery charger came with a free Midtronics Tester as a special offer by Rotronics during the show. Ticketer had a hook the duck theme on its stand. 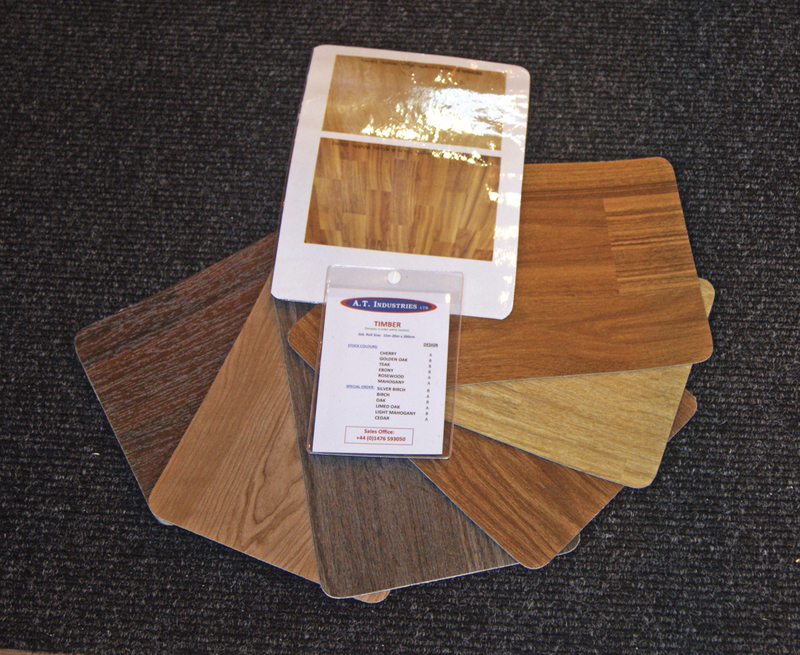 AK Carpets new Performance leather effect material. Meridian Coachworks had an interesting vehicle on its stand. Pride and Joy’s winning image with Greys of Ely. Gas Alliance explained the biomethane production cycle. Suppliers of products and services are an essential part of our business and over 200 of them took space at Euro Bus Expo displaying their latest innovations or just catching up with customers. Although it wasn’t possible for the Bus and Coach Buyer team to talk to everyone, we discovered much of interest that was now in the market place or close to being there. We also heard from many suppliers that they had developments in progress which we can look forward to announcing in 2017. Alliance Electronics are official distributors of the PowerVamp battery jump starters amongst their wide portfolio of electrical and electronic parts for the industry. A specific bus and coach parts catalogue is produced. 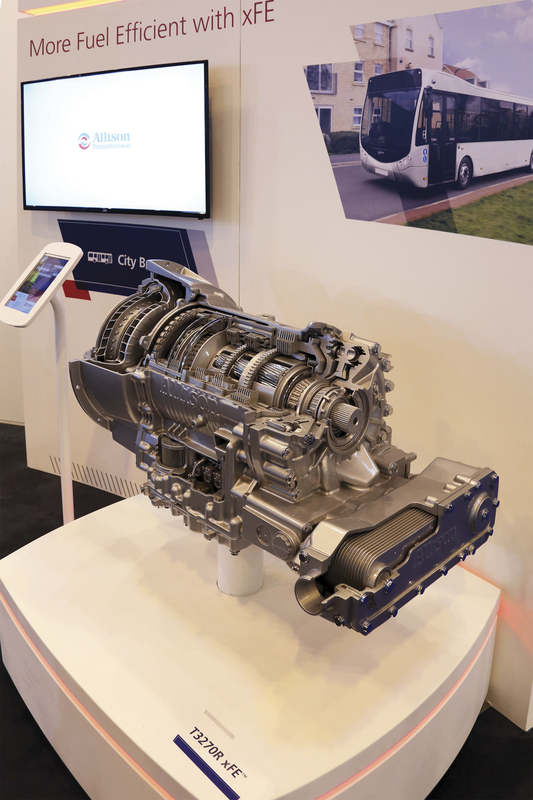 Allison Transmission’s stand featured a cut away display of their T3270R xFE transmission which is designed to increase fuel efficiency. The model is used in Optare’s latest Metrocity demonstrator that has delivered a claimed 8% improvement in fuel economy under independent testing. The T3270R is the latest of four models of the xFE range now available in Europe. News from Be-Ge Seating UK is a new contract with Lothian Buses. One of the company’s newest seats is the 7000/9000 Comfort Line, which features additional side support in the backrest and seat. They are covered with Vogue fabric, designed for durability. Options include armrests, headrests, electric heating and its ‘Airvent’ equipment. A seat occupancy check system, Belt Check, was shown by iDrive. The device has sensors on seats to detect when someone is sat on them and whether they have their seatbelt on. An onboard screen shows the layout of the seating on the vehicle, with colour coding telling the driver whether the seats are occupied and/or the belts fastened. It was demonstrated on Prime Passenger Seating’s product. Launching its new rear LED lights, the 54XX series, was BMAC. The lighting and electronic control systems specialist has launched the product to complement its ‘front of bus pack’, the Opti-Lux LED headlight. It has also developed its ‘light guide technology’, involving continuously illuminated LED pipes to create lighting solutions intended to allow greater design flexibility and functionality than traditional LEDs. The company was recently acquired by Grakon LLC, a designer and developer of advanced lighting and electronic systems. Carlyle Vehicle Technology, a new brand under the Carlyle Bus and Coach umbrella, displayed for the first time to the UK industry. Based from Carlyle’s Dublin branch, it provides a full suite of technology solutions, integrating a vehicle’s onboard electronic equipment. It uses the Teldat gateway connector to integrate such technology as CCTV, fleet tracking and e-ticketing. As well as supplying components to the industry, Carlyle now provides a glass fitting service. Chapman Driver Seating showcased its range of driver seating with a mock up cab area and a ‘new’ vintage car on its stand. The company now offers a range of office seating manufactured to the same standard as its driver seats. Several new products were shown by Checkpoint, the wheelnut indicator supplier. These include a chrome wheelnut indicator, which is due to be launched next year, as well as a reflective version. A new removal tool has been released, designed for the removal of Dustite products, the company’s wheelnut indicator/dust cap product. Cummins Euro6 repowered Routemaster was one of the first vehicles to greet visitors to Euro Bus Expo, being displayed on the NEC forecourt. On its stand, it displayed its new generation Smart Efficiency B4.5 and B6.7 engines. Alongside its range of vehicle heating and cooling products, Eberspacher displayed a new compact driver’s cool box, intended for cab installation. The 12V or 24V portable cooler has capacity for two two litre bottles which can be maintained at 2C when the ambient temperature is 32C. Visitors to Eminox’s stand were advised how its SCRT retrofit technology provides an effective route to complying with London’s Ultra Low Emission Zone (ULEZ). From September 2020, all vehicles entering the ULEZ, which covers the same area as the Congestion Charging Zone, will need to meet Euro6 standards or pay a daily charge. For heavy duty vehicles that will be £100 per day and the penalty for entering the zone in a non-compliant vehicle, without paying the fee, will be £1,000. Buses operating on Transport for London (TfL) controlled routes will need to meet the ULEZ standards one year earlier in 2019. In addition, 12 Low Emission Bus Zones (LEBZ) are to be implemented in pollution hotspots and the first two have already been announced, Putney High Street (February 2017) and Brixton to Streatham (October 2017). Eminox SCRT retrofit technology can be retrofitted to allow older vehicles to meet the new requirements. 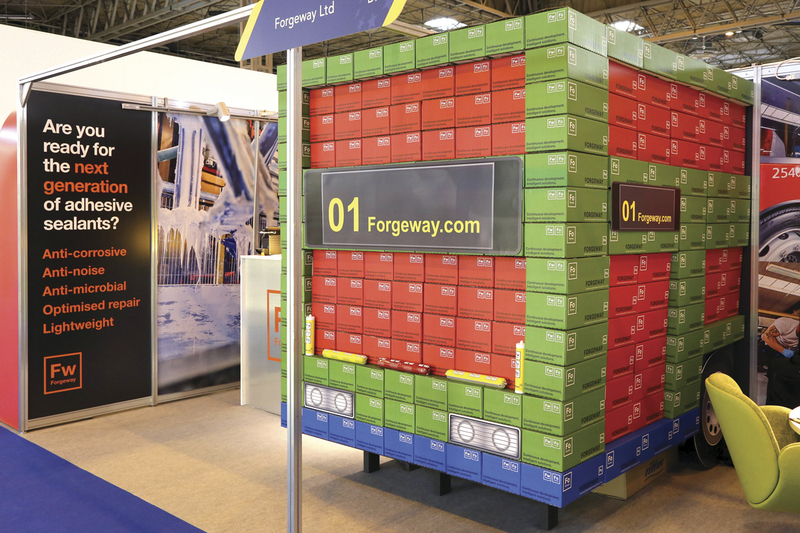 Bonding and sealant specialist, Forgeway, has this year rebranded its products. It has created a brand based on the periodic table and used the same principle of categorisation to deliver an identification system to educate users. To unveil this new branding, the company created a ‘bus’ made up made entirely of its new outer packaging. Each box colour used to build the vehicle referenced a different Forgeway range and application in vehicle manufacture. Showing its new look logo for the first time was Giti Tire. The company is to relabel all of its brands, including GT Radial, with the new look. The newest tyre it had on display was its GSW226 winter tyre, an M+S, three peaks marked design for snow, ice and wet road conditions. It has wide shoulder ribs for good resistance to irregular wear. Promoting the idea of ‘complete bus technology applied’ was Grayson Thermal Systems. A large diagram showing the various cooling systems and other associated products was displayed. The company produces battery thermal management systems, electric engine cooling packs, electric water pumps, electric water heaters, demisters, saloon heaters and convectors. A new product it has recently launched is a three element electric cab heater, delivering 750W of heat from a 24V DC power source, featuring a safety thermal cut out and two blower speeds. As well as being the sole UK agent for the bus and coach market for Thermo King air conditioning systems, the company is in partnership with Zeta Automotive to distribute that firm’s EconoSpeed Connect acceleration control system, designed to save fuel costs and increase passenger comfort. It was hard to miss Heavy Duty Parts at the show with both their busy stand and conveniently placed eye level advertising. Their Product Overview booklet was being promoted. 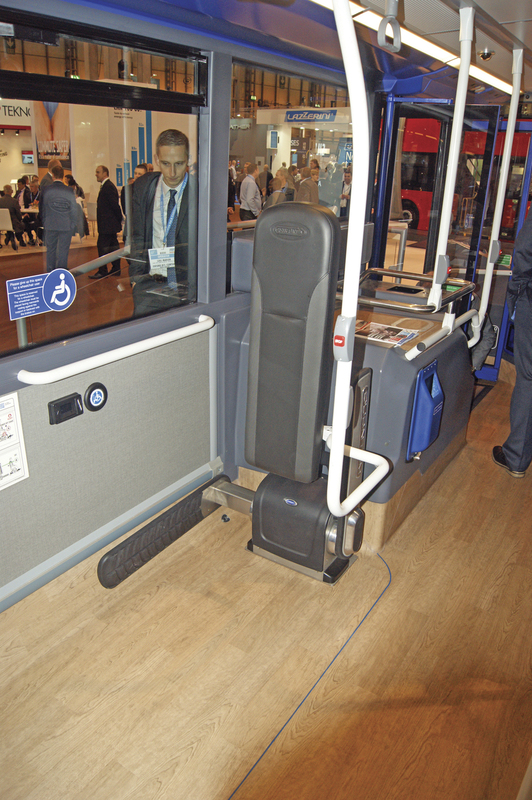 Masats may be best known for doors, but one of the main items on the company’s stand was its new Wheelchair Lift KS7 version 1400 for intercity buses. The one on display was for mounting in the luggage bay floor, but versions are available for placing in the entrance steps. Also on show was a telescopic ramp, the manual RM2 ramp for city buses, the electric sliding door 028C, an electric in-swinging door for city buses and a large outside opening door for coaches, electrically driven with pneumatic locks. As well as being an approved Irizar parts distributor, Masterpart demonstrated how it offers a comprehensive OEM all makes parts program. Known for converting York’s City Sightseeing buses to all electric, Magtec promoted its alternate power train repower service. One of its tray mounted repower packages provided a convenient table space emphasising its compact nature. With a large, eye catching stand full of its destination displays, one of McKenna Brothers’ main attractions was its ‘Talking Buses’ equipment. It’s Mobi Access Web system allows operators to use a web connection to remotely change the wording on destination displays. The company also showed its Bluetooth app, allowing the user to write the text and configure the screen using Bluetooth technology. Visitors could rest their feet on N&M Fibreglass’ stand with the chairs they had constructed using bus bodywork mouldings. The company manufacturers GRP replacement panels for the industry. Its service includes design assistance, tooling, delivery, pattern making, manufacture and quality assurance. 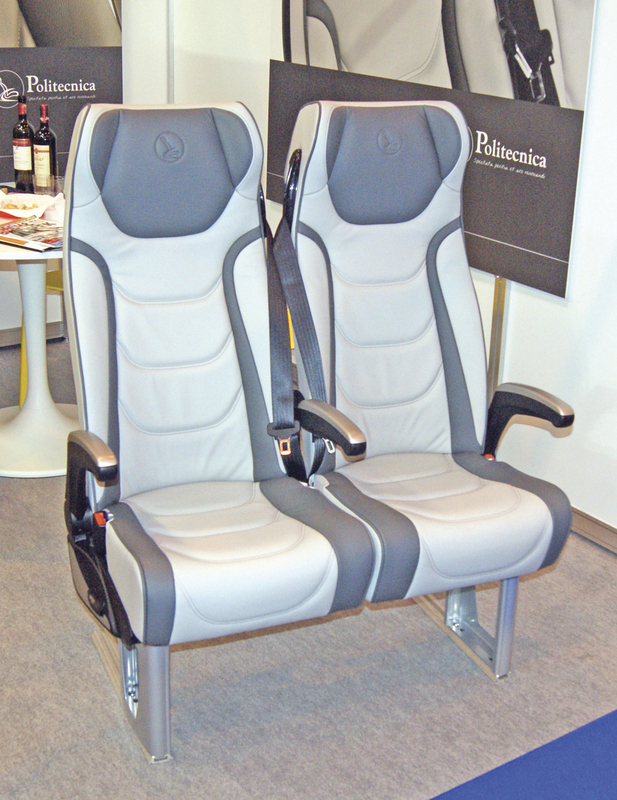 Relax Formula, one of the newest seats from Politecnica was shown. Designed for the highest of comfort, the seat comes with the options of USB sockets, monitors and a number of other accessories. Real leather was used to upholster the one at the show, but the seat can be personalised to customer requirements. Following the merger of PLS (Passenger Lift Services) with Mobility Networks the company has begun to expand their range of equipment most notably in the areas of extra steps and ramps including items from the CarOil range, the long established Italian access equipment suppliers acquired earlier this year by Mobility Networks. An important feature of the merger with CarOil is that it gives Mobility Networks access to a massive service network throughout Europe. 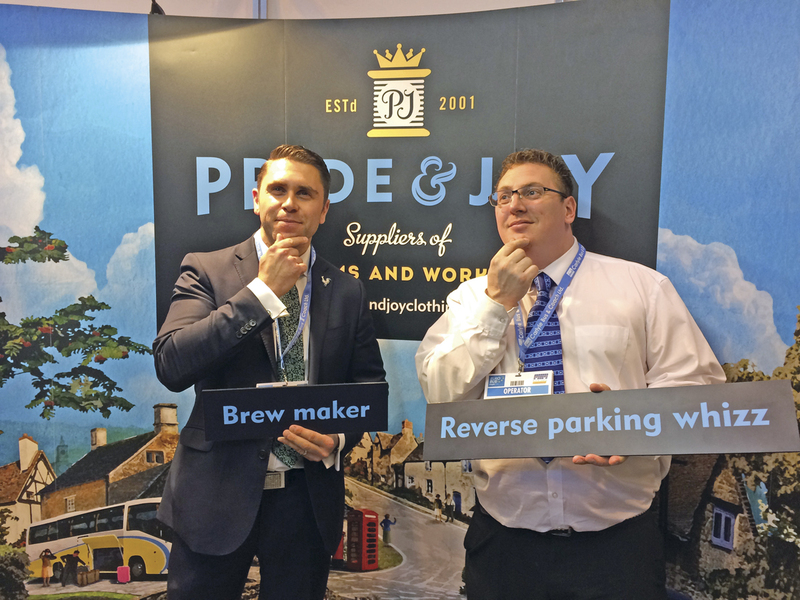 At the Show, Mobilty Networks MD Adam Beck, launched a range of new items to be sold via PLS. These include new lifts, steps and ramps. On lifts they introduced the easily installed 500kg i6-H Mega Coach Lift range for use on full size coaches. Of interest to operators who do ski tour work, they also announced a basic ski locker lift for use on coaches and also the more sophisticated EQM Ski Locker Lift. PLS announced a new lift to their Access range, the V Spec lift, a low cost alternative for less frequency usage. It incorporates simple manual operation, aluminum platform and aluminum cassette construction. On ramps they introduced new manual and powered units including flip-over, fold over and cassette styles in a variety of sizes. A new quick release, lightweight aluminium extruded rear ramp stows vertically. They also announced a new range of extra entrance steps in both manual and powered form and in a range of widths. Powered ramps and steps all incorporate devices to halt the action should the ramp edge touch anything and most have lights will flash when the equipment is operating. News from Q’Straint was that Lothian Buses has requested 30 of its Quantum automatic wheelchair securement systems for its tour bus fleet. The operator has already trialled the technology, as has East Yorkshire Motor Services (EYMS). According to the company’s Marketing and Communications Manager, Sara Carter, the product has garnered plenty of uptake in the US and there has been a lot of interest in Scandinavia. Already claiming the lightest bus seats in the market, Ster had examples of their forthcoming lightweight pole and handrail range which will compliment them on display. This will allow Ster to offer a full lightweight interior package. The company’s seats were installed in the electric vehicles on both the BYD and Yutong stands. Also shown was a wireless passenger identification system developed initially to show seat occupancy but now being considered for wider uses. As well as adding the Barum 215175R17.5 tyre to its range, TD Tyres has launched a new app. The free mobile application allows users to get instant access to the company’s special offers, delivery tracking, product catalogue, instant price requests and latest news. It also includes a quick dial tyre breakdown service. Seats from various manufacturers were displayed by TEK Seating, including Grammer, KAB Seating, USSC, FISA, Isringhausen and Be-Ge. It was showing USSC’s new 9000 series designed to lessen driver fatigue and stress. Additionally, it had one of Isringhausen’s latest products, as well as Grammer’s MSG 90.3 driver’s seat. Demonstrating its latest SmartNet technology was Voith Turbo. The system continuously and automatically monitors the condition of its DIWA transmissions from a remote location. The transmitted data can be viewed remotely by a Voith service engineer. The ‘health check’ scheme is designed to predict potential transmission failures, allowing timely maintenance before a failure. In a year it has attracted 16 bus depots to using this scheme. According to the company, the scheme can cut gearbox costs by up to 68%. The PCV sensor system specialists, Xvision, displayed its Vehicle Powerline Communication (VPC) device. It uses the vehicle’s existing power cables on the vehicle to power the system’s sensors and is intended to make installing equipment easier and quicker. One of the most interesting exhibits from 21st Century was not on its stand, instead it was on the Arriva liveried full electric Yutong bus on display. The company used the vehicle to demonstrate its connected bus concept, which sees key technology systems connected as per the ITxPT standards for connected passenger transport electronic technology. The vehicle has HD IP CCTV systems, passenger information screens, passenger Wi-Fi, passenger counting and an android screen for driver applications, as well as telematics and driver performance monitoring equipment. On 21st Century’s stand were solar powered and E-Ink bus stop display screens. 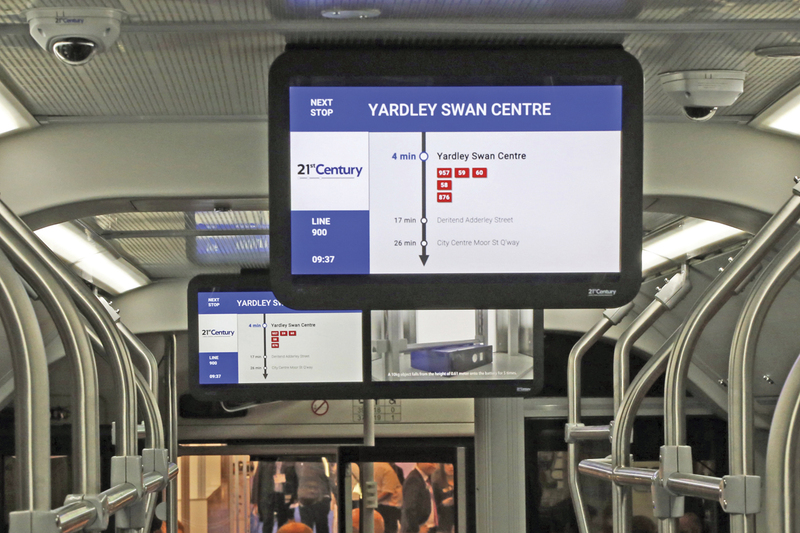 the new range includes real time passenger information (RTPI) boards and bus shelter displays with advertising capabilities. The new Funtoro infotainment system was launched by Autosound at the show. The system allows passengers to connect to it and access movies, the image from the front view camera, music and other entertainment on their personal device (laptop, phone, etc). There was a Bosch multimedia system shown that now features a wireless crew microphone with charging station, also a Bosch onboard Wi-Fi system available on subscription. Bowmonk and In-CarPC launched the T5 Event Data Recorder (EDR), an online system with built in accelerometer, digital inputs and connection to the CANbus. It is capble of recording a wealth of information at high resolutions. A new service was launched by the company too, an onboard 4G Wi-Fi router and hotspot services. From the In-CarPC division, this accompanies the IBR1100 on-board router and features remote management of all the fleet’s routers, advanced hotspot services (including capturing passenger contact details, branded hotspot splash screens and controlling data usage) and web content filtering and mobile data packages. Information on the Clockwatcher analogue and digital tachograph analysis software from Aquarius IT was available. It was also showing its driver walk round check app and demonstrating its eSign digital signage system, which allows users to digitally capture drivers’ signatures on infringement documentation via touch screen tablets and PCs. A range of new fleet telematics and fleet management products were displayed by Continental. These include the VDO DLD Wide Range II, which is designed to give fleet operators direct access to a web based service for the wireless transfer of data from the mass memory of the digital tachograph (DTCO) and driver cards. It includes telematics functions such as position recording and vehicle diagnostics via CAN or other inputs. It has a SIM card as well, which should make it easier to communicate with the driver. Continental has also teamed up with TomTom Telematics, linking TomTom Webfleet with TIS-Web, part of VDO Continental’s brand. A free driver Walk-around Check Mobile App drew the crowds to Distinctive Systems’ stand. For its Coach Manager private hire and contract booking system, it works either in conjunction with new core functionality incorporated into VMS, or, for users who do not have VMS, in conjunction with a new standalone application called the VMS Walk-around Check Edition. Users of Coach Manager and TBS can download a free copy of this. It guides the driver through the complete process for performing the check. Against each item to be checked the driver has to either touch a green button to say it is OK, or touch a red one to report a defect. When a defect is found the driver can choose from a list of predefined common defects or enter their own description. Up to four supporting photographs can also be included for each defect. The walk-around check cannot be submitted until every check has been completed. The completed walk-around check results include the date and time it was carried out, the time taken to complete it, the vehicle distance reading and the GPS location at which it was done. The mobile app stores the results locally until it picks up either a Wi-Fi or mobile data signal. Explaining how its MIIPS system can help operators connect onboard technology was Faltcom. The vehicle hub links the various items onboard and sends data from them to the back office. It can be used for various applications, including CCTV, passenger counting and voice communication. Joel Kidd from Find My Bus was there promoting his bus tracking app for passengers. He has plans to create a single platform for the app, which he says is an idea that has gone down well amongst those he has spoken to at the show. As well as fire monitoring and suppression equipment, Forman Vehicle Services displayed its V series of LED monitors. The technology connects with vehicle lighting circuits to passively monitor up to six low power LED light circuits. When one of the circuits fails, the system provides failure feedback. The latest in-vehicle road safety cameras, that live record collisions and dangerous driving incidents, were demonstrated on the Freeway Fleet Systems stand. The 3G camera solutions were being promoted by fleet technology experts, WISE Procurement, in association with Freeway. Experts were on hand to explain the 3G ‘instant notification’ cameras. Unveiling its Onboard Digital Advertising Network (ODAN) was LetsJoin. The system gave visitors the chance to participate in a free passenger Wi-Fi evaluation. The company’s service is intended to allow customers to discover potential advertising revenue and create a risk free business case for providing free Wi-Fi. First launched in Lothian Buses in 2015, the platform has been developed with media buying agencies. It has been certified for use with Wi-Fi hardware manufacturers. Demonstrating its MOBILE solution, INIT was demonstrating how it claims it can cover the entire process of public transport operations. It was showing its MOBILE-PLAN software, which provides automated timetable and duty planning, as well as its MOBILE-PERDIS, which organises the staff deployment process. The company was also talking about how it supports the UK’s first fully integrated capped fare multi-modal ITSO smart ticketing scheme, with the introduction of the new Robin Hood Card in the Nottingham area. Displaying its Davis card licence reader was LicenceCheck. The device picks up all watermarks on the card to ensure it is compliant and checks it with the DVLA within seconds. The system can be configured to check licences that have, for instance, more points more frequently. The system can be linked into the company’s fleet data management system. Lytx was promoting the latest in its range of fleet management systems and software. This includes the Unisyn platform, a video telematics model designed to give quality video access and expandability to fleets and field operations of all sizes and profiles. The new package works with the company’s DriveCam platform, using it to help prevent collisions through programmatic coaching, and Unisyn’s ‘always-on’ video to track, monitor and act on fleet and field operations. Mobile ticketing specialists Masabi have recently agreed contracts with National Express West Midlands and Preston Bus, the Preston Bus system going live towards the end of Euro Bus Expo. The web based solution works alongside existing on bus and paper ticketing systems and enables a range of tickets to be purchased on line and displayed to the driver when boarding. Significant savings are expected in boarding times, particularly where weekly tickets were previously being sold on bus. Debuting its mTicketer, a smart electronic ticketing machine (ETM), was Mobile Onboard. It is powered by the company’s mobile ticketing technology and features a touchscreen, built in GPS, Wi-Fi and cellular 4G. Visitors to the METRIC stand were treated to preview demonstrations of its latest on-bus electronic ticketing machine (ETM), the SmartQUBE. The new ETM has been modularly designed for flexibility in positioning. The device consists of the passenger-facing qube, featuring a clear display screen and large smartcard reader. It has a mounted tablet for the driver with an eight-inch, full colour touch screen. It also has an LED ‘smile’, designed to indicate to the passenger if a smartcard transaction has been successful or declined. The product forms part of a complete ticketing solution including the Mobile POS handheld ticketing machine and cloud based back office system, Futurefleet. An app designed to play a video when triggered by a certain image was promoted by National Resources. The image is scanned by a phone or tablet’s camera, which then triggers a video to play, a web page to load or a 360 degree tour of whatever the image shows to start on the mobile device. The free to download Vu-AR Magic app is envisioned to be useful when advertising vehicles for sale. You may well know Novadata for administration supplies and training, but Novadata has launched itself into the world of apps with its latest offering. It has released the Convey WalkAround app, designed to provide a complete DVSA Walkaround compliance solution. The system captures all walk around checks by drivers, creates reports based on the information gathered and reports when it picks up on any issues with vehicles. It is priced at £1 per vehicle per week and can be used as many times as desired. Furnished with a classic Manchester Leyland PD2 rather than the customary Routemaster, the Omnibus stand demonstrated a range of its software solutions for bus and coach operations management, including a new timetable compiling system. The latter is designed to allow users to quickly and easily put together a timetable, including adding in advertising and company logos. Plenty of positive feedback from visitors sampling it was reported by the Omnibus team. Also on show was its depot allocation system OmniDAS, including the newly enhanced driver communication app myDAS Touch, which allows drivers to access all their own details, including rota and holiday details, from their phone. Representatives from the company were on hand to talk about the possible open data implications of the upcoming Bus Services Bill. Ticketing specialist, Parkeon, was highlighting how it claims it is playing a key role in rolling out contactless payments across the UK transport network. The company is set to deliver one of Europe’s most advanced multi-modal ticketing systems, featuring contactless technology, as part of major transport infrastructure investment in Northern Ireland. SmartDrive Systems was showing visitors how its SmartChoice programme can help them. According to the company, the driver performance programme reduces collisions by up to 50%, improves fuel consumption by up to 3% and achieves significant reductions in the total cost of risk across a fleet. The video based driver safety system provides fleets the freedom to choose the level of protection that best aligns with their specific business priorities and needs. Whether the fleet operator’s primary objective is exonerating drivers from frivolous or fraudulent claims from other road users or passengers, protecting drivers by capturing and coaching risk or preventing collisions with up to 360 degree visibility to risk, SmartChoice is designed to offer a solution to meet each fleet’s distinct requirements. Under the banner of ‘The Future: Working Together’, Synectics was engaging with visitors with a host of seminars. The company was asking how technologies such as Internet Protocol (IP) networks, wireless communication and systems integration are shaping the future of on-vehicle CCTV and the industry as a whole. News from the public transport surveillance specialist was that it is to provide CCTV systems for the BYD electric buses with Metroline and Nottingham City Council. They will be fitted with the company’s ruggedized T1600 16-channel digital video recorder (DVR) with hybrid IP capability, alongside a mix of 16 analogue and IP cameras. 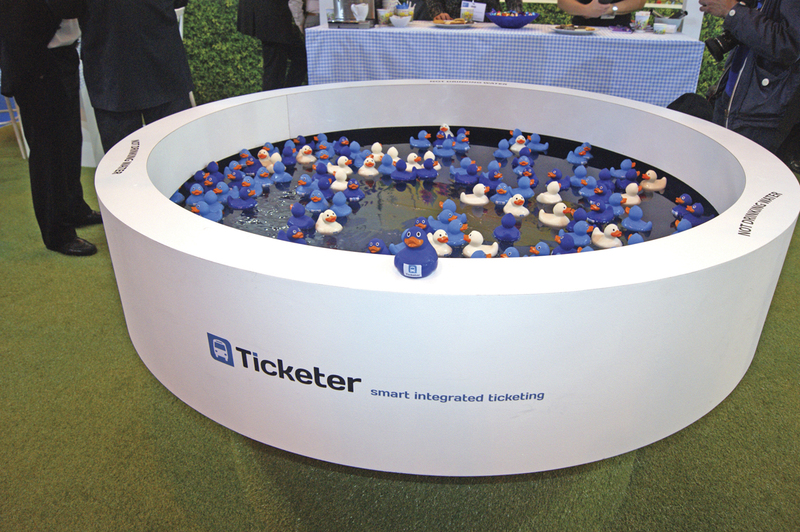 Hopefully not having gone totally ‘quackers’, Ticketer had a hook-a-duck theme on its stand. The company has developed the facility for operators to add bespoke coupons to tickets as they are printed from the Ticketer Electronic Ticket Machine. This has been designed to give operators the ability to incentivise and reward passengers at no additional expense. The coupons differ from the traditional money off coupons, typically pre-printed on the back of tickets, because they can be tailored to the time of day, day of the week and even to the route or ticket type. They are available now to all existing Ticketer operators through the Ticketer back office, enabling them to instantly set the coupons up themselves. The TyrePal tyre pressure check system was displayed at the show. It constantly measures tyre pressure, alerting of puncture or pressure loss. It features an onboard monitor to make the driver aware of any problems. The tyre data is captured by sensors mounted inside or outside the tyres, which transfer data wirelessly to the monitor. The company also has its TelePMS central fleet monitoring system that transmits tyre data and the current GPS location of the vehicle to a database. A leather effect material, Performance, was displayed by AK Carpets. The company specialises in various coach fabric for flooring, walling and sides. 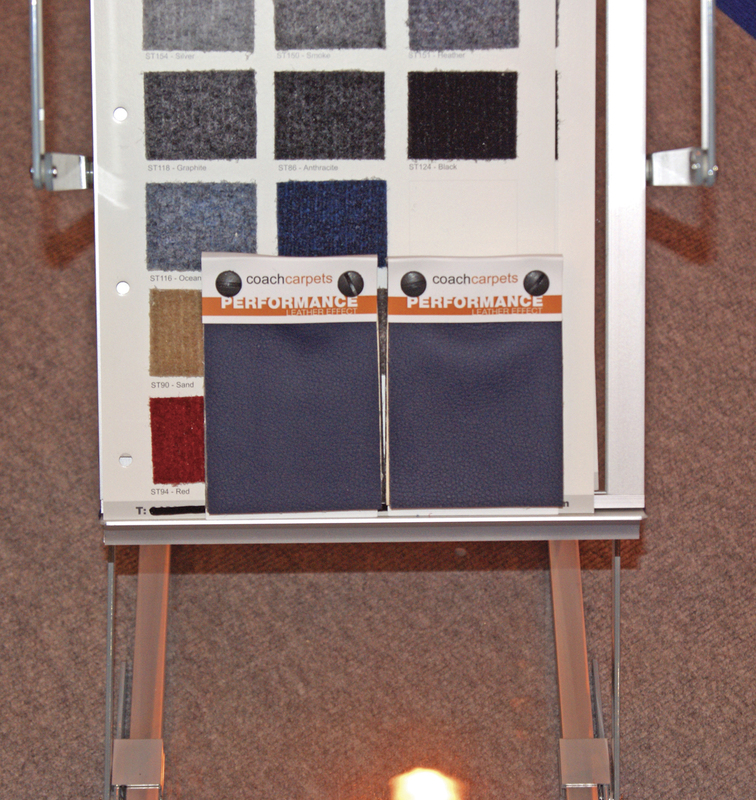 A range of different fabrics was displayed by Camira. Famous for its traditional wool moquettes, the manufacturer’s Aura and Fusion ranges feature the traditional moquette combined with contemporary designs and colourways. 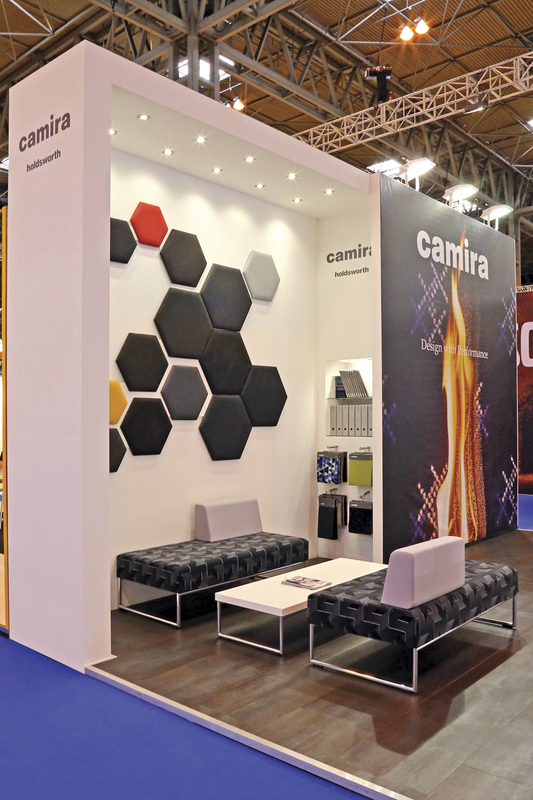 Within the portfolio are lighter weight pile fabrics with added design and texture, streamlined flat weave fabrics for seating, leather, vinyl, and a wide range of textile ancillary trims for piping, headrests, curtains and wall sides. Aura is a high quality wool moquette with contemporary designs, featuring speciality yarns in certain ranges to create added texture and depth. Fusion is a high wool content moquette fabric, 10% lighter in weight compared with traditional pile fabrics, designed to save raw materials, giving fuel saving potential and reducing operating costs, without compromising technical performance. The company offers a full custom made design service to create client specific fabrics to fit individual requirements. D&H Commercial Repairers was there, promoting its ‘one stop shop solution’ for bus and coach repairs. Everything displayed on Epengle Tekstil’s stand was new. The company also had an example of a flat weave for coach seats and is looking to expand the styles and colour palette of its procucts. Leather Plus, a new synthetic leather from Fabercon, was shown for the first time. It combines shavings and trimmings from leather processing, creating a fibre from it. The material is then treated with polyurethane resin and a surface coating available in a number of colours is applied. It has been designed to be more flexible and stretchy than other synthetic materials. A new top coat has been launched by Glasurit, a paint brand of BASF, which features an improved binder to enhance the gloss and flow. The company was also talking about its multi-substrate primer, for use on various surfaces. It is chromate free, making it ready for the next generation of paint legislation that bans this substance. Historically, the business supplies a lot of bus and coach refurbishers, but can also provide to operators. An anti-scratch clear coat is available that ‘heals itself’, according to representatives from the company, allowing the paint to look better for longer. 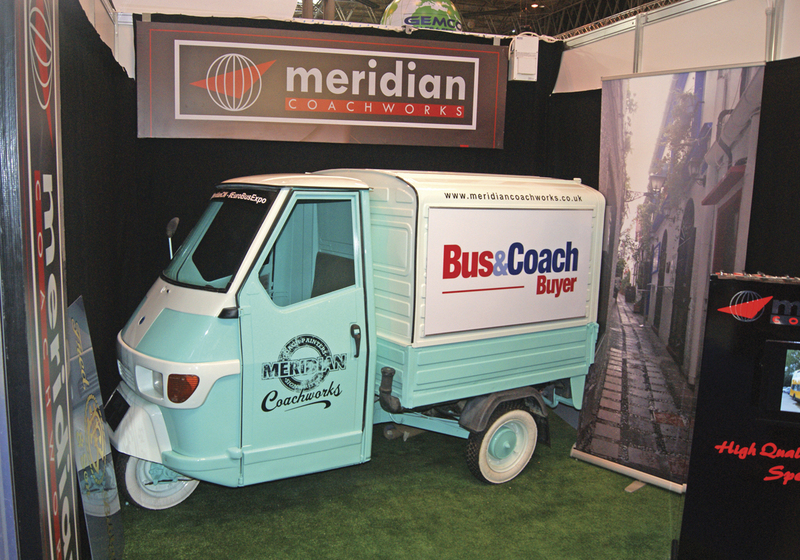 Meridian Coachworks had an eye catching stand with a refurbished three-wheeled mini van painted up and bearing the company’s name. The guys from the bodywork and refurbishment specialists were taking pictures of visitors in the vehicle, which had a section where operators’ livery could be slotted into place, and posting them on social media sites. It gained much attention. Despite the focus on synthetic and reformed leather in the industry, there is still a market for real leather. Muirhead Leather showed a range of leathers suitable for the bus and coach market, including its Venturer offering. New trucks for transporting buses and coaches to its site have been taken on by Thornton Brothers, the nationwide PCV repairer. The company can take care of complete refurbishment and conversion of vehicles, providing a collection and delivery service across the whole country. A special show offer on Delphi’s DS450 vehicle diagnostics system saw it priced at £250. It comes with an extra two cables. Ppromoted by Gemco was the Autop Stenhoj column lifts. They feature plastic nut sets, a carriage with six guiding wheels and lubrication free roller bearings. Electronically synchronised, they have a programmable top stop. Optional extras include an LED lighting set, a power pack, an extra control unit, wheel holders and a set of four wheel forks. Departing from its usual exhibit of a gantry bus wash at the show, Karcher focused on its industrial cleaners for depot, yard and workshop floors. It had a number of push and ride on versions of its floor cleaners and scrubbers on show. Also displayed were vacuum cleaners featuring extra long hoses for PCV aisles. A roller brake tester priced at £13,300 was one of the main attractions at Liftmaster’s stand. The device has been stripped of any non essential features to deliver the attractive price. Displaying one of its prefabricated steel pit accessories was Premier Pits. The company is renowned for its pink steel inspection and maintenance pits. A special show offer was available from Rotronics, which saw those purchasing the CTEKpro60 battery charger getting a Midtronics Tester for free. New column lifts were displayed by Totalkare. Additionally, the company promoted its fixed post lift range. Available in a range of capacities from 16 to 33tonnes, and with platform lengths of 7 to 18m, the fixed post lifts are suitable for lifting most types of bus or coach. The lighter models are ideal for minibuses and other more compact public service vehicles. They can also be surface or recess-mounted with a galvanised option also available for external or wash-bay applications. This is the first time the company has brought such products to a show aimed at the bus and coach industry. Demonstrating the lift’s capabilities were two vehicles, a minibus supplied by David Fishwick and an ADL Enviro 200 which will be the final Euro5 powered vehicle to be supplied new to Go South Coast. BrakeMate, a brake maintenance system, was shown by Tulip. The device provides an elevated service platform for servicing heavy vehicle disc brake assemblies. It is intended to eliminate all manual lifting during the maintenance process and should substantially reduce service time. Examples of its range of garage equipment for testing and maintaining commercial vehicle fleets were shown by VL Test Systems. The company was also highlighting the emissions test equipment it supplies from Premier Diagnostics. With an example of a driver’s uniform similar to those it supplies Yorkshire Tiger, First Corporate Clothing was present. The company offers a bespoke service, designing uniforms to customer’s specifications. New shirts were one of the products displayed by Pride and Joy, as well as a ladies blouse. Amongst many other garments on show were soft shell jackets. MD, Jane Drayton, said these are proving more popular than fleeces currently, being waterproof and breathable. New polo shirts from Asquith and Fox were on show, which Jane described as looking very corporate, adding there is better awareness amongst operators of how they dress their drivers and advising that the company has been nominated in the Derbyshire Times Business Awards. Their photo competition was won by Greys of Ely. A magnum of champagne will be on its way to the lucky operator. Select Uniforms showed examples of its Lochs and Glens and Thamesdown uniforms, as well as an array of garments it can supply the industry. The team from CPT was at the show to promote the benefits of joining the trade organisation, as well as to meet existing members. As usual, it was offering 14 months’ membership for the price of 12 to anyone who signs up at the show with the next year’s price fixed at this year’s rate. Meeting existing and potential benefactors, Transport Benevolent Fund was there. The charity provides financial benefits, advice, bereavement grants, medical help and complimentary and alternative therapies. It costs £1 a week to join. ABB promoted its charging systems for electric buses with both a plug in rapid charger and a model display showing how opportunity charging using inverted pantographs can be integrated into a bus station environment. Rapid chargers are based on multiples of the 50kW units which the company has been supplying to recharge electric cars. A multi standard example of these, the Terra 53 CJG was shown. Standardisation of the overhead opportunity charging process for buses is being developed with other manufacturers including Siemens. There was considerable interest in the Efficient Fuel Technology stand which was promoting ‘EF10 powered by Dipetane’, a fuel enhancement product produced in Ireland since 1986. Containing nothing that is not already in the fuel, Dipetane is a nearly clear odourless fluid suitable for all engines which meets EN590 and supports full combustion, thus maximising the energy output from the fuel whilst reducing emissions. The product is retailed in litre bottles in Ireland and is available in up to 1000l magnums for fleet users. Based on current fuel and Dipetane prices, a net saving of around 7p per litre is claimed, representing around a 10% improvement in fuel economy. The company showed testimonials from bus and coach operators confirming the products effectiveness. It was an important show for Gas Bus Alliance following the unveiling of the Scania based ADL Enviro 400CBG double-decker and the award of government grants earlier this year for a significant number of gas powered buses. 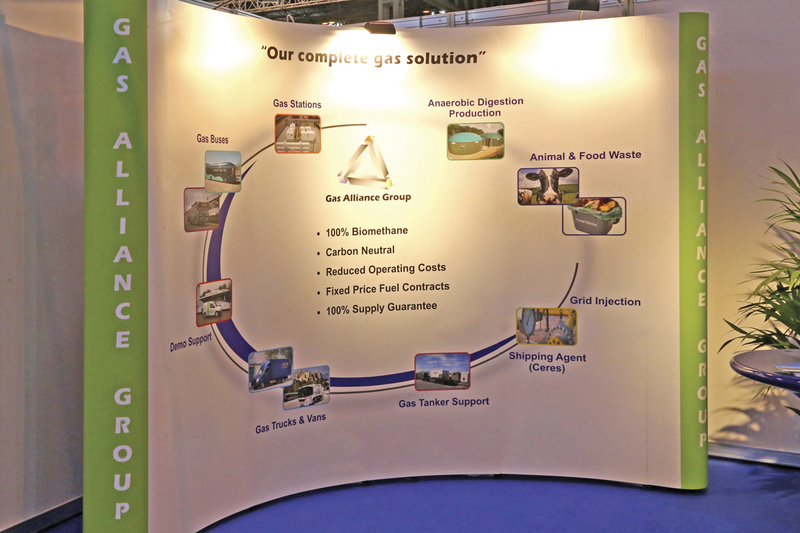 The stand featured a large diagrammatic showing how agricultural slurry was transformed into a near carbon neutral fuel for vehicles and representatives were on hand to explain the process and the mysteries of the different names applied to basically similar, at point of use, gas fuels; biogas; Biomethane; CBG; CNG; Natural Gas; Methane. LowCVP, the low carbon vehicle partnership, launched its latest publication at the show. The Low Emission Bus Guide provides a comprehensive overview of the technologies that exist to minimise the impact of buses on air quality. It defines a low emission bus as ‘one that achieves more than 15% WTW GHG emission savings compared to an equivalent Euro V bus and meets the Euro VI engine emissions standard or proven equivalent levels.’ Electric, hybrid, fuel cell and gas vehicles are covered in addition to enhanced diesels. Visit www.lowcvp.org.uk to download a copy. Merridale showed a selection of its current fuelling systems and associated technology. Fuelling systems provider, Timeplan were exhibiting at a bus and coach show for the first time in several years to promote the availability of web based software for their systems. They offer the full package including dispensing equipment, civil engineering, electrics, systems and servicing.